Julian wants to be a mermaid but what will his Nana think? With love and acceptance bursting from its pages, Julian Is A Mermaid by Jessica Love (Walker, £11.99) is a celebration of being yourself. Mesmerised by the mermaids from the Coney Island Parade, Julian floats along, curious about what it would be like to be one of them. Sparse text and sublime illustrations give the book a magical feel as real life shifts in and out of Julian’s imagination. This stunning book exudes warmth and joy. Bright and contemporary, Xavier Deneux’s Jungle Animals (Abrams & Chronicle, £7.99) is a sturdy board book with all sorts of creatures to discover. With simple raised textures this is a lovely book to share, or for little ones to explore on their own. 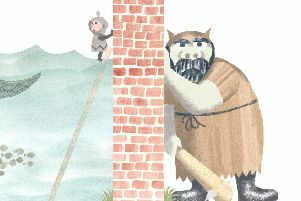 In Hansel & Gretel (Two Hoots £11.99), Bethan Woollvin draws her characters in bold lines with mischievous expressions. When Hansel and Gretel chew holes in the good witch’s gingerbread house and wreak havoc with her spells, can she remain a good witch for long? A fantastic cautionary tale with an unexpected twist – children will delight in this playful retelling of the classic fairy tale, which is full of Woolvin’s characteristic dark humour and smart writing. Explore the playful side of poetry with your child in Thinker: My Puppy Poet and Me (Tiny Owl, £9.99). When Jace meets his new puppy, they realise that they both love to speak in poems, creating a lovely collection of rhymes, haikus and raps as they experiment with language together. Eloise Greenfield’s lively text and Ehsan Abdollahi’s vibrant, collage-style illustrations combine in a celebration of art and words which is perfect for sharing aloud. When Thomas offers to help his grandad with the garden, the last thing he expects to find is a dragon fruit tree, with tiny dragons hatching from the fruit! Flicker the dragon is definitely more exciting than an ordinary pet, but his fire-breathing habits make him a bit of a handful, and quite difficult to keep secret... This ingenious premise is brought to life with great skill and humour by author Andy Shepherd and illustrator Sara Ogilvie in The Boy Who Grew Dragons (Piccadilly, £5.99). Andrew Carnegie was born in Scotland, but his legacy can be seen in libraries across the world. His inspiring story has now been adapted to share with young readers in The Man Who Loved Libraries: The Story of Andrew Carnegie (Pikku, £8.99). Author Andrew Larsen and illustrator Katty Maurey pay tribute to this great philanthropist, following him from his difficult childhood, through his years of hard work to the realisation of his dream to bring books to everyone. A worthwhile read celebrating perseverance and the transformative power of libraries. Ruby’s heart belongs in Australia, the place where she can remember her mother most clearly, so when her dad announces that they are moving to the mountains in India she is terrified. At first her new home seems as scary as she imagined, but when she finds that the local wildlife is under threat from poachers, she begins to see things differently. In When the Mountains Roared (Orion, £6.99), Jess Butterworth’s love for the landscape and the animals she describes shines through, creating an immersive world for Ruby and the reader to explore and fall in love with. Michael Morpurgo and Barroux have teamed up for the first time to share a very personal story about two brothers torn apart by World War Two. In Mouth of the Wolf (Egmont, £12.99) is based on the lives of Michael’s uncles Francis and Pieter who chose very different paths when faced with the harsh realities of war. By turns thrilling, moving and thought-provoking, this is a stunning collaboration pitched perfectly to enable young readers to find out about what the war meant in the context of love, family and sacrifice. Hanna Konola’s Art Masterclass with Vincent Van Gogh (Wide Eyed Editions, £9.99) is an excellent activity book for any budding artist. Information about Van Gogh’s life and style is complemented by a step-by-step journey through his various techniques, drawing from some of his most famous works. This book provides space to experiment with colour, gives tips on using perspective and much more, leading up to the creation of your own masterpiece. A beautifully produced book to teach, inspire and excite artists of the future. StoryCon gives teens support to learn new skills and develop their interests, as well as the chance to meet creative professionals and build networks and friendships with other teens through their shared love of reading, writing and illustrating. Workshops included writing for videogames, advanced comic illustration, research methods for writers and breaking out of writer’s block. The aim is to encourage creativity and with the school holidays stretching ahead there are many ways to build on this for children and young people. Summer holidays are the perfect time to encourage creativity in children of all ages. If you are looking for inspiration, try providing different writing prompts such as quirky characters or mysterious settings as a hook for a piece of writing or illustration. You’ll find lots of great suggestions at www.scottishbooktrust.com/writing.